“Clean eating” seems to be the diet fad catch-phrase these days, and while I’m not completely sure what it means, from what I understand from my fragmented, over-stimulated Internet browsing research, it basically means that you try to eat things that are as close to natural form as possible. No processed foods. Anything store-bought has to have ingredients that are pronounce-able and as close to form as possible. From here, various factions of dieters can take the concept in such directions as vegetarian, vegan, gluten-free, Paleo, etc. but the fundamental theme seems to be the intent to reduce intake of chemical or natural food additives that may be harmful to some degree. May I take a sidebar to note that I’m not a nutritionist, nor anything close to a medical professional who knows the ins-and-outs of the generalized “clean eating” trend? I’m simply a blogger whose personal tendencies are to gather as much information as possible about the food I eat in order to decide what works best for me. Anyway, personally, I try to abide by this still-evolving concept of clean eating and try to only select foods that, if I can’t make it for myself, have as few ingredients as possible— like, just because I moved back to Nebraska doesn’t mean I’m about to start making my own Greek yogurt, puh-lease. One example is peanut butter. I go through about a jar of peanut butter in a week. Okay, maybe like 4-5 days. Is that bad? I don’t know. All I know is, it’s freaking amazing with green apple slices that I used to replace my usual toasted whole wheat English muffin at breakfast. I either choose Smucker’s Natural Peanut Butter or Trader Joe’s Creamy Unsalted Peanut Butter, both of which only use peanuts as the main ingredient. However, sometimes it occurs to me that I could probably make my own nut butter if I wanted to and right now, due to a recent hazelnut impulse buy at Trader Joe’s and the fact that Santa for once paid attention to my Christmas list and left a food processor under my tree (my first one ever owned), I decided that it might actually be worth a try to make my own hazelnut butter in the name of all things clean eating. Why not, right? 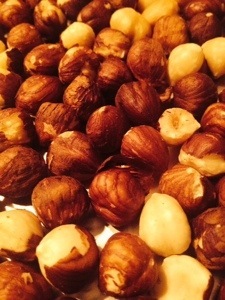 Step One: Start by spreading the hazelnuts out on a foil-lined baking sheet and setting them in a pre-heated oven at 375 degrees. I decided to leave the light on for this part, but discovered quickly that you really can’t tell when the nuts are roasted. So, about 7 minutes after setting them in the oven and getting bored checking on the nuts as I puttered around the kitchen, I left the room for a few minutes and was greeted by the most subtle, warm, roasty smell which indicated to me that the nuts were done roasting and it was time to take them out of the oven. 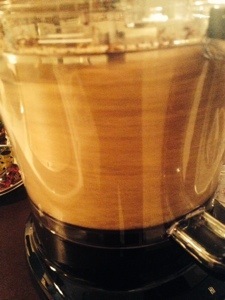 Pulverizing hazelnuts in a food processor is LOTS of fun! Optional Step Two: Enjoy an hour-long Google Hangout with your cross- country friends while the nuts cooled off. Step Three: Once the nuts have cooled off, pour them into a food processor, secure and lock the compartment, and start processing. This was the fun part for me. Every once in awhile, I had to stop the processor to scrape the sides down since pulverizing nuts doesn’t really do anything except create a lot of dust that flies everywhere and sticks to the inside of the container. However, as I soon began to see, continuing to process the nuts eventually drew out the natural oils and the mixture started sticking together. 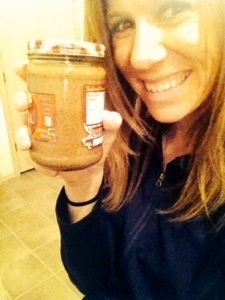 I like my nut butter more on the creamy side, so I kept processing and checking every once in awhile for consistency. The entire processing time took about 15 minutes tops. Fifteen minutes free of palm oils, added sugars, and any other processed junk found in peanut butter! I’m still waiting for the catch…. Optional Step Four: …which leads us to this next step. Hazelnut butter by itself doesn’t have as much flavor as I thought it would. It was delicious, no doubt, but there was definitely room to add some sweetener and maybe a little salt. I didn’t add these things myself, but my mother did when I texted her about my newest adventure in cooking and she said she added honey and salt to taste and it was much better. Starting to look like butter! So that’s how you make your own nut butter. I haven’t decided if I am going to make it this way from now on– nuts are expensive, especially almonds and hazelnuts, and at the rate I go through a jar in a week, the cost-per-use ratio doesn’t seem justified. 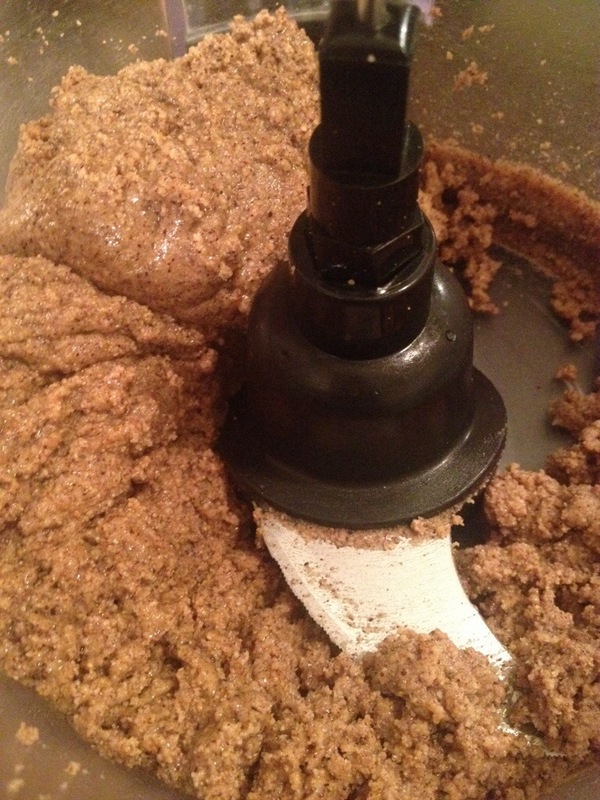 Perhaps when I come down from my addiction and go back to a normal usage level, I will make my nut butters this way. Sorry, Smuckers Natural Peanut Butter, you have been replaced this week!